Can an upward sloping marginal revenue curve exist? - FreeEconHelp.com, Learning Economics... Solved! Home law of demand microeconomics monopoly revenue Can an upward sloping marginal revenue curve exist? Can an upward sloping marginal revenue curve exist? I have been getting a lot of questions about the possibility of an upward sloping marginal revenue curve recently. The first few times I blew it off because it is one of those "possible" scenarios that never really happens. Unfortunately, it seems that a bunch of instructors have asked their students about this, and I don't blame them for being confused. This post will go over the economics of an upward sloping marginal revenue curve, including a numerical example and an example of where we may see it occurring in the real world. In order to get an upward sloping marginal revenue curve, it is necessary for the demand curve to be upward sloping. This is because the marginal revenue curve always has twice the slope of the demand curve. Another way to think about this, is that the demand curve always follows, or chases the MR curve, so if the MR is upward sloping, the demand curve will have to be as well. Note that their is a potential problem with having an upward sloping MR curve. If the slope of the MR is greater than the slope of the MC curve then the optimal solution is to produce an infinite amount of a product. Also, by understanding how a giffen good works, we know that a demand curve cannot be upward sloping forever because eventually the consumer will run out of money. This means that an upward sloping MR curve can only occur over a range of possible values. Ultimately, having an upward sloping MR curve is rare, but is technically feasible. It requires that the market structure be either monopolistically competitive or a monopoly, and that the good in question be a giffen good. Marginal Revenue has twice the slope of the demand curve only for a straight line demand curve. 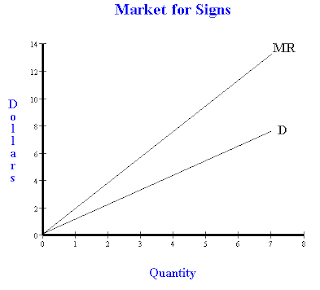 If the demand curve is downward sloping but yet non-linear then we could have a upward rising MR. For example, Units (1,2,3,4,5,6,7), Price (20,16,12,10,9,8), TR (20,32,36,40,45,48), MR (20,12,4,4,5,3). Creating a table with these numbers gives us increase in marginal revenue from the 4th to the 5th unit.